Fundraiser by Shira Sebban : Don't Let Them Go To An Orphanage! Don't Let Them Go To An Orphanage! 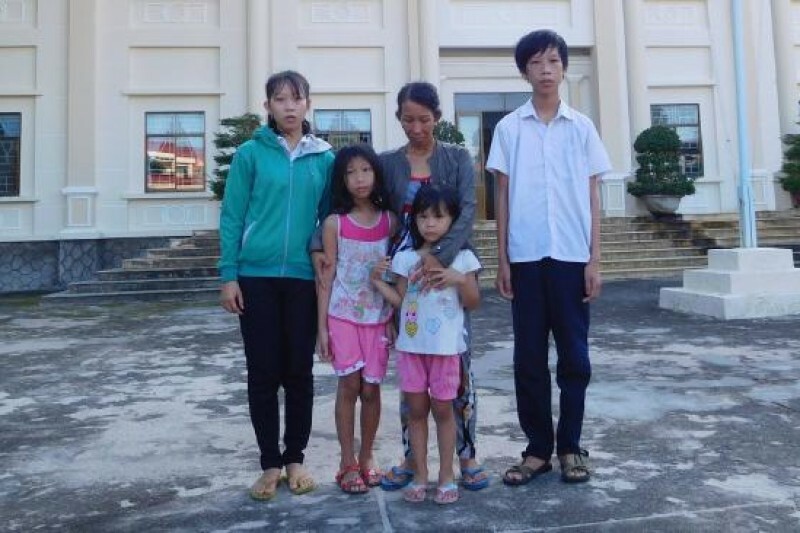 This is Mrs Tran Thi Thanh Loan, with her four children, aged 4-16. Mrs Loan is a a Vietnamese failed asylum-seeker, who is about to start a three-year jail sentence for helping organise an "illegal departure" to Australia in the family-owned fishing boat. Her husband, Mr Ho Trung Loi, is already in jail, seven hours' drive from where the family lives, and is not due for release until mid-2017. No one in the extended family can afford to look after their children and so they had been told to leave their school and were to be sent to an orphanage. I read about their plight and decided to try to help Mrs Loan's parents care for her children. I could not bear the thought that the family was to be torn apart. I contacted Mrs Loan's lawyer, Mr Don An Vo, and he put me in touch with Mrs Loan. Won't you join me in helping her family so that the children can continue to go to school and live with their grandparents? It will cost $AUS 425 a month to cover the children's living expenses. That's just over $5000 for the year. I have already sent the first month's payment to Mrs Loan via bank transfer, and would like to try to raise $10,000 in total to ensure the children are well cared for, and have money in the bank to help their parents too, especially when their father is released next year. Well we did it! Thanks to the incredible generosity in particular of Christina Nguyen we have reached our target! We are so grateful to everyone who participated in our campaign. A big thank you on behalf of Mrs Loan and her family.... I have now turned off the donations to this campaign. Please feel free to post comments in support of the family. The campaign for Mrs Loan and her children is almost over. It would be wonderful if we could raise another $600 for her family to ensure they are well provided for the next two years. Once we reach our new target of $11000 I will close the campaign. Thank you to everyone for all your help. We have reached our goal! $10,000 raised in just over three weeks thanks to 106 generous people of various cultural backgrounds and walks of life. Thank you so much to everyone who participated and helped to keep Mrs Loan's family together. I am very excited to announce that we have now passed the $7000 mark! Thank you so much to the 78 donors so far, who, in just two weeks, have contributed so generously to help Mrs Loan's four children. Not far now before we reach our goal! Shira, how incredible. This just shows the power of social media in helping bring about a new life for this family. Thank you for taking on this mammoth task. My heart for the children!